Rockstar has announced four new DLC packs for Red Dead Redemption, bringing new multiplayer action, mini-games, anti-griefing measures and even zombies to the hit western saga. "Our goal is to continue to pack as much entertaining gameplay and as many surprises as we can into the massive world of Red Dead Redemption over the coming months," said Rockstar co-founder Sam Houser. And he's not kidding around, because beginning in August and running through the fall, Rockstar's multi-million-murdering cowboy sim will be getting some serious DLC love with not one, not two, not even three, but four individual releases. The first DLC release, the Legends and Killers Pack, will include nine new multiplayer map locations and eight new characters, as well as a new weapon called the Tomahawk. Following that will be the Liars and Cheats Pack, which will add still more multiplayer modes including Attack and Defend, horse races with mounted combat, eight more characters, multiplayer versions of Liars Dice and Poker from the single-player game and another new weapons, the "Explosive Rifle." Next up is the Free Roam Pack, featuring new Free Roam challenges, "action areas and defensive placements," posse scoring and leaderboards and the addition of new anti-griefing measures, and then last but certainly not least will come the Undead Nightmare Pack, which will add a brand-new single-player adventure with new quest, animals, dynamic events and more, along with eight new multiplayer zombie characters. 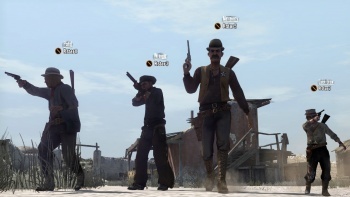 All four Red Dead Redemption DLC packs will also bring new Achievements and Trophies to the party. The Legends and Killers Pack is slated to come out in August, while release dates for the rest have yet to be confirmed. Legends and Killers, Liars and Cheats and Undead Nightmare will be available for $9.99 each on the PlayStation Network or 800 Microsoft Points on Xbox Live, while pricing on the Free Roam Pack, for some reason, hasn't been set. More information about each will be released as they get closer to launch.